Our History, Our Lives, Our Future. We’ve mentioned Bella Freak *a lot* on this website, and won’t be stopping any time soon. But what is Bella Freak? Was Bella Freak a show? Certainly. 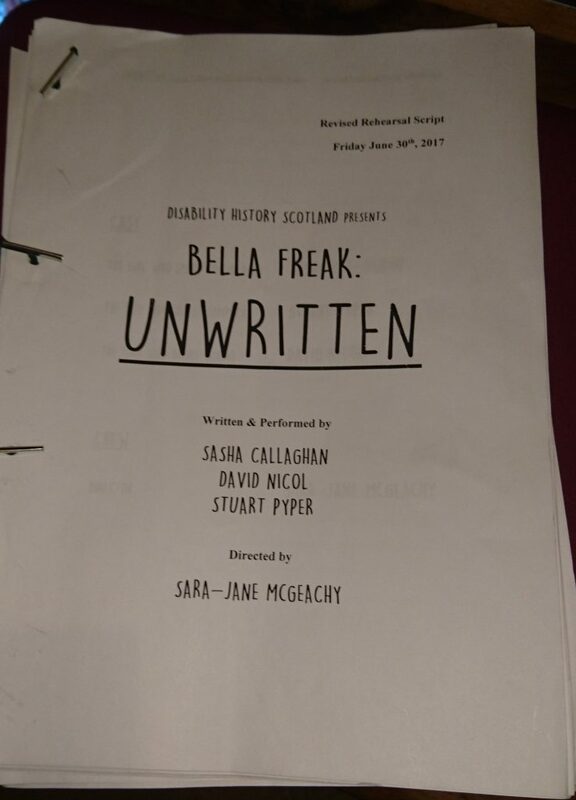 Our acclaimed HLF-backed Fringe show, Unwritten, was promoted under the Bella Freak banner. But Bella Freak is something more. It was started as a response to the lack of physical access to cultural spaces and events, as well as a recognition that the lives and stories of a wide section of Scottish society goes unheard. The brand-spanking new Bella Freak section of the DHS website can be accessed here, or from the menu bar at the top of every page. This tells you more about Bella Freak, and about The Case for More Inclusive Festivals and Events: Still Not There, Yet!, the Big Lottery-funded research report on disabled access to arts and cultural events in Scotland. 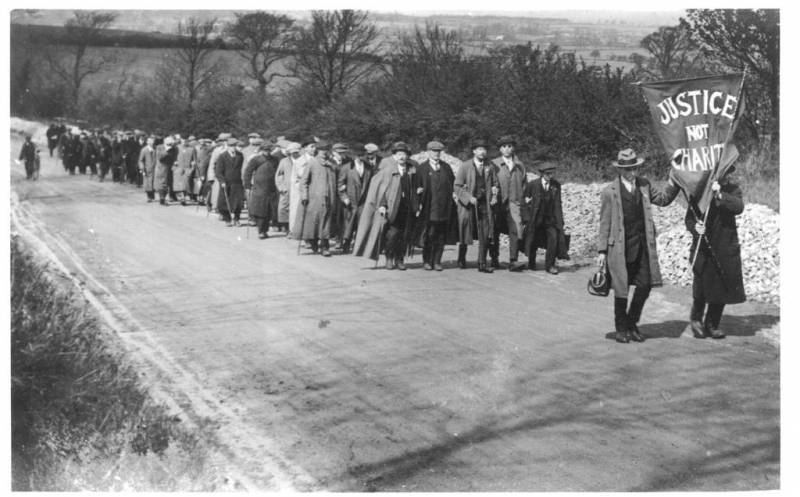 On 25 April, 1920, 200 blind protest marchers organised by the National League of the Blind converged on Trafalgar Square as the House of Commons met to discuss legislation to help secure the economic and social rights of blind persons. Thousands of Londoners gathered to join them and listen to the speakers. WHAT IS JUSTICE NOT CHARITY..? 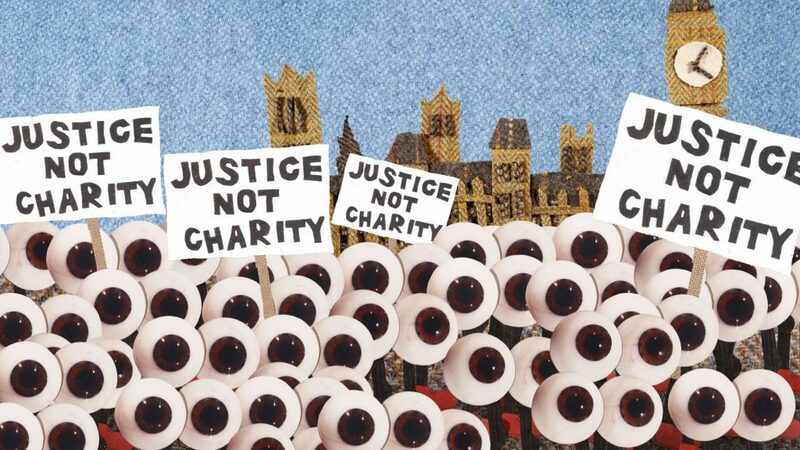 Justice Not Charity, Was Their Cry will explore the Scottish dimension of the 1920 National League of the Blind march by investigating Scottish popular press representation and archival evidence in the records of trade unions and blind organisations, and we’re looking for volunteer Citizen Researchers to assist the project and attend workshops over the next few months. Workshops are meant to be fun, co-operative spaces where Citizen Researchers can report on their on-going results, troubleshoot problems with help from peers and workers. They can also spend the workshop time actively researching, especially if they don’t have the time or resources to do so at home. Depending on the needs of Citizen Researchers, workshops can also serve to make research materials accessible with volunteers and project workers reading or transcribing sources. Workshops can also be spaces to create art or other forms of creative engagement with the project. • An introduction to Disability History Scotland. • An overview of the history of the National League of the Blind march. • An introduction to research techniques and historical resources. • Tea, coffee and lunch will also be provided. To book a place at the workshop, click here. Performances on August 4th, 8th and 12th will be Accessible performances with a BSL interpreter and captioning for Deaf/deaf audience members. Please Note: Audio Description was originally advertised for August 4th, 8th, and 12th. This service is sadly no longer available for these performances. Tickets for Bella Freak: UNWRITTEN are now on sale from the Edinburgh Festival Fringe box office. Find out more about the show below, and click here to purchase. Tickets can also be purchased from the venue box office, and from all Space venues at this year’s Fringe. Anywho, UNWRITTEN… we’re rather proud of it you, and our cast and crew have been hard at work in rehearsals. Our Heritage Lottery-funded Fringe show is running from August 4th-12th (not 6th) at Theatre 3, The Space @ Surgeon’s Hall (Venue 53). Check out our preview ad below, and book your tickets here! 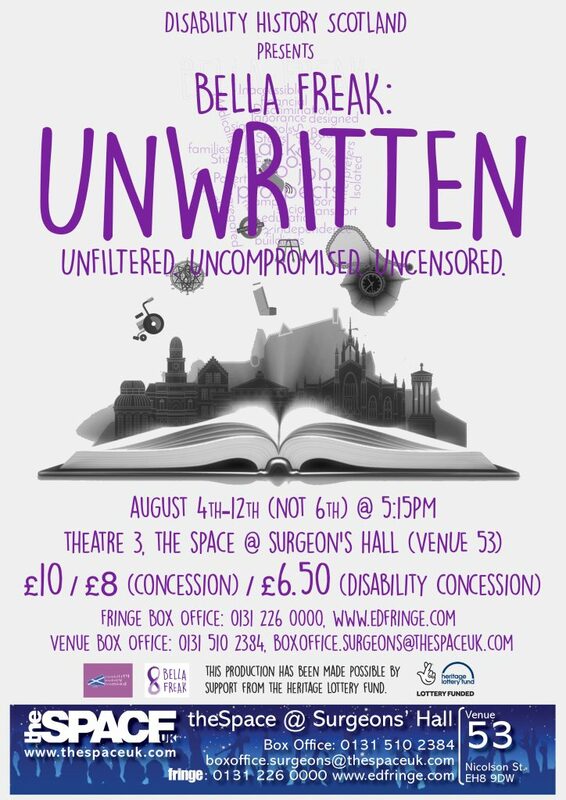 UNWRITTEN: Get Your Tickets NOW! Performances on August 4th, 8th and 12th will be Accessible performances with a BSL interpreter, captioning for Deaf/deaf audience members, and audio description for the visually impaired.